I’ve featured a few of Jens Juel’s (pronounced with soft js, “Yens Yuel” for reference) paintings on this here blog before. Juel is generally thought of as one of the most famous artists from Denmark of all time. His specialty was portraits. Juel received his education from the Royal Danish Academy of Art at 20 years old. When he had finished his education he, like many other, if not all, Danish artists at the time went to Rome for eight years to study the art in the Eternal City. A veritable community of Danish artists was formed here. Returning to Denmark these artists brought with them new styles and methods to the delight of polite society. He also stayed in Paris and Genève before returning home to Denmark in 1780 and gradually became the go-to painter for high society. Royalty and nobility, and everybody else who could call themselves members of high society sat for him. He was also chosen for several prestigious positions at the Academy of Art. 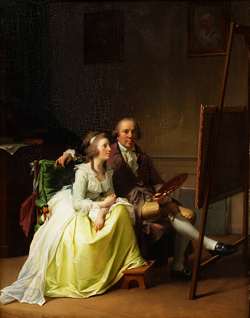 The Artist and his Wife, Rosine (née Dørschell). 1791. 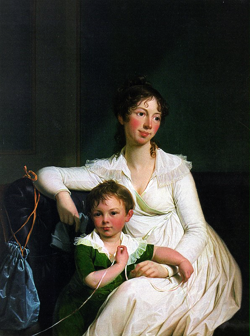 Rosine and Jens had several children. Two of their daughters went on to marry artist C.W. Eckersberg, presumably not at the same time. Princess Louise Augusta. 1780. 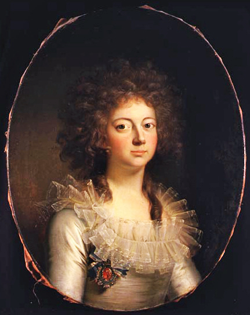 This is one of the first portraits of the period that feature a woman in style of the French revolutionaries. 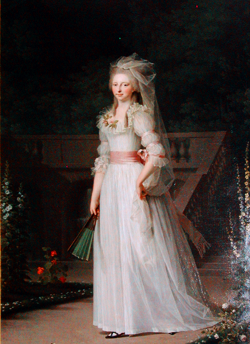 When the portrait was first presented to the court, the outline of Louise Augusta's legs could be seen and Juel was promptly told to paint them over. Frederick, who later became Frederick VI of Denmark, brother of Louise Augusta. I think these two portraits must have been ordered together. They were sent to the English court (their mother, Caroline Mathilde, being an English princess) and when I last visited Holyrood Castle they were hanging there. I asked a curator about it and since some other paintings had been taken down and sent to London for an exhibition these two were sent to Edinburgh to be hung. Sophie Marie of Hessel-Kassel, Queen of Denmark. She was married to Frederick VI. 1790. Apparently her title before she was married was "Her Serene Highness" which is pretty cool. Noblewoman With her Son. 1799-1800. 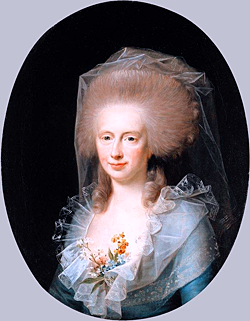 Caroline Mathilde, mother of Frederick and Louise Augusta. 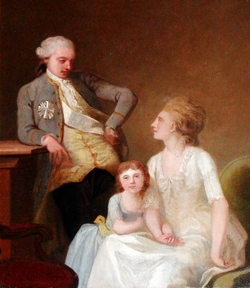 Niels Ryberg with his son Johan Christian and daugjhter-in-law Engelke, née Falbe. 1796-97. Christian VII of Denmark. Father of Frederick VI and Louise Augusta. 1789. 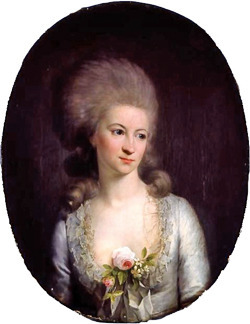 Augusta Louise of Stolberg-Stolberg, friend of Goethe and wife of a Danish minister.. 1780. Chamberlain Johan Frederik Lindencrone, husband of Bolette Marie. 1787. 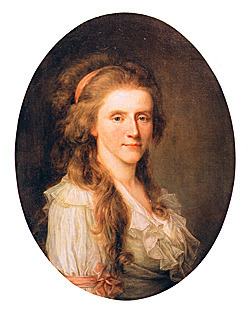 Eleonora Hennings, 1780s, wife of a Danish minister. I love the fashion from the period during which he was active, and I love studying the features of family members he painted.